The App Store model has moved beyond consumer realm to become a new service delivery platform for the enterprise. Consumers, partners, and employees are now invited to drive innovation using a variety of exposed APIs, upload mechanisms, and platform hosted tools. As Intel launched AppUp, it knew a host of security issues needed to be addressed to meet corporate security compliance regulations. From scanning uploaded content for rogue payloads, to putting in place a perimeter that could defend back-end systems from SQL injections, and countermeasures for DOS attacks….the list was extensive. 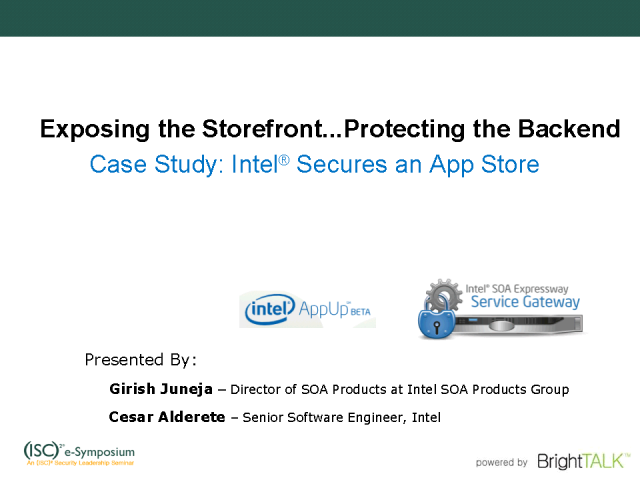 In this session, learn how Intel architects offloaded security processing to a Service Gateway ensuring fast performance and a consistent user experience. Learn how this portable security architecture is well positioned for future cloud deployment plans.